Youthful skin doesn’t come easy. While most of it is owed to good genes, there is a lot one can do to keep the skin from aging too quickly. 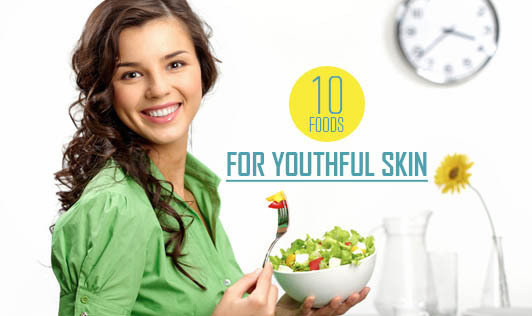 And a good diet is one of the main necessities for youthful skin. Green tea: Start your day with green tea. It detoxifies your system and is loaded with antioxidants. Eggs & Almond Milk: Have a portion of hard-boiled eggs for breakfast along with a cup of unsweetened almond milk. You actually get the apt dose of proteins and vitamin E, both of which are considered best for healthy, young skin. Carrots: Add a carrot or two to your salad. They are rich in vitamin A and C, and various other antioxidants that protect against skin problems. Berries: If a powerful punch of antioxidants is what you are looking for, berries should do it for you. These tiny powerhouses pack anthocyanin and ellagic acid. Anthocyanin helps mitigate free-radical damage and ellagic acid aids in the breakdown of elastin and collagen in the skin. Beans & Legumes: They are rich sources of protein, fiber, and vitamin B12. Legumes also contain zinc and vitamin B6 that aid in tissue growth and repair. Nuts: Heart-friendly nuts help fight diseases better and are good sources of selenium which maintains tissue elasticity. Olive Oil: The oil has been known for many years now as the best food for the gorgeous skin. It is rich in anti-oxidants, heart-friendly fatty acids, and Vitamin E that helps neutralize free radicals. Sardines & Salmon: Oily fish such as sardines, salmons, and mackerel provide a good dose of protein as well as omega-3 fatty acids that help keep the skin soft. Oranges & Gooseberries: Eating an orange or gooseberry, or drinking gooseberry juice regularly can keep the skin from sagging as they are rich in vitamin C and antioxidants. Who doesn’t want to look young forever? Take your pick and include these super foods in your diet for youthful, glowing skin.